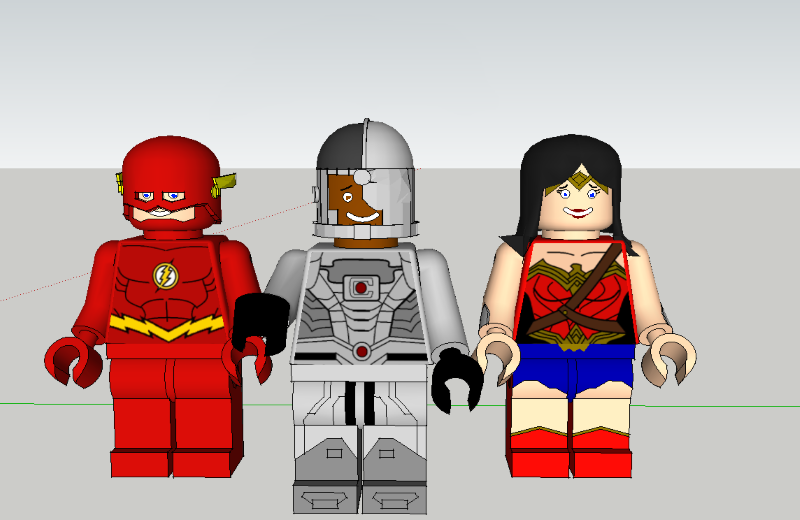 I’ve made a new sketch for Justice League Day on Saturday – took a little longer for two reasons: first, it has eighteen pictures in it, and second, I had to create some new models in SketchUp. The previous ones I’ve done have had the figures in place but any hair (Superman and Commissioner Gordon) or masks (Batman and Calendar Man) have been hand drawn once I’ve taken a screen shot and dropped it into my image software. Sometimes it’s looked okay, other times not so much. Wonder Woman’s hair isn’t too bad, but Cyborg’s helmet (stop sniggering at the back) and especially Flash’s mask just look awful, and I would have had to draw each of those elements multiple times from multiple angles. which I’m much happier with. 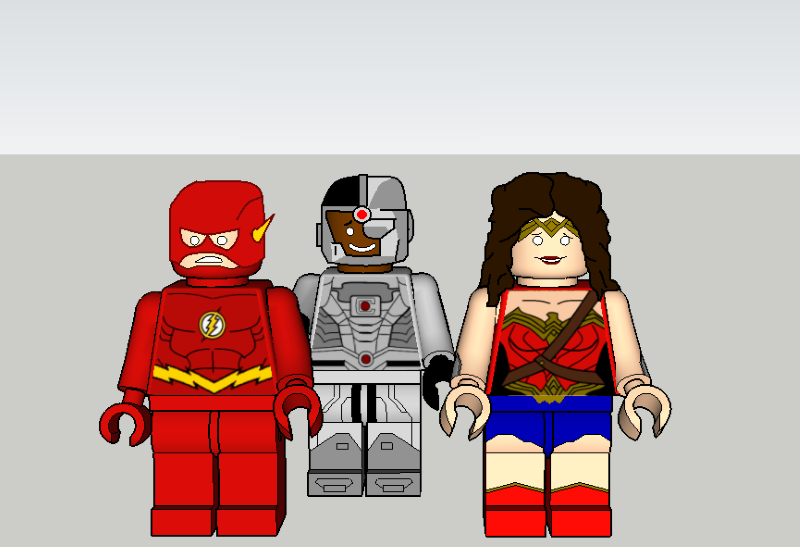 Still need to work on Flash’s mask, and Wonder Woman’s hair is just a bit lifeless, but it’s better than my hand drawing. Posted on Thursday, November 16, 2017 Monday, October 15, 2018 by GaryPosted in UncategorizedTagged Cyborg, Flash (Barry Allen), Lego, Wonder Woman. Damn dude! Very-well done on those designs. Yeah I can see how the Flash’s cowl could give you fits, but you did good man. For me personally, the first version of Cyborg is better, although his metal half did need a bit more work as far as being smoother and more symmetrical. WW tho….just looks plain creepy in the face, especially the second version. Christ that’s creepy! Thanks – like I said, I’m much happier with the Flash. In terms of cowls/masks, I did Batman first, learned some stuff, did Cyborg, learned a little more, then Flash, so I think each one’s better. As and when I re-use Batman and Cyborg, I’ll definitely be re-doing the masks. And Batman’s cape as well – that’s still hand drawn. As to Wonder Woman looking creepy . . . hahahaha! I definitely need to work on some expressions, more than just mouth and eyebrow which is what I’ve done here. You’ll get the hang of it man, I don’t doubt that for a second. The more practice you have doing these, the better and probably quicker you’ll get at doing them.